The 12 boys and their soccer coach rescued from a flooded cave in Thailand waved, smiled and offered traditional "wai" greetings in their first public appearance on Wednesday, at a national broadcast in the northern province of Chiang Rai. Doctors, relatives and friends, some in yellow traditional garb, greeted the boys, aged 11 to 16, and their 25-year-old coach. They wore T-shirts emblazoned with a red graphic of a wild boar and carried in footballs they kicked gently on the set. "Bringing the Wild Boars Home," read a banner in Thai on the set, designed to resemble a soccer field, complete with goalposts and nets, where the boys arrayed themselves on a dais, beside five members of the rescue team. A crowd of media and onlookers was penned behind barricades as the group arrived in vans from the hospital where it has stayed since last week's international effort to extricate it from a flooded cave complex where it had been trapped. "I told everyone fight on, don't despair," said one of the boys, recounting how they battled during the excruciating days in the cave. 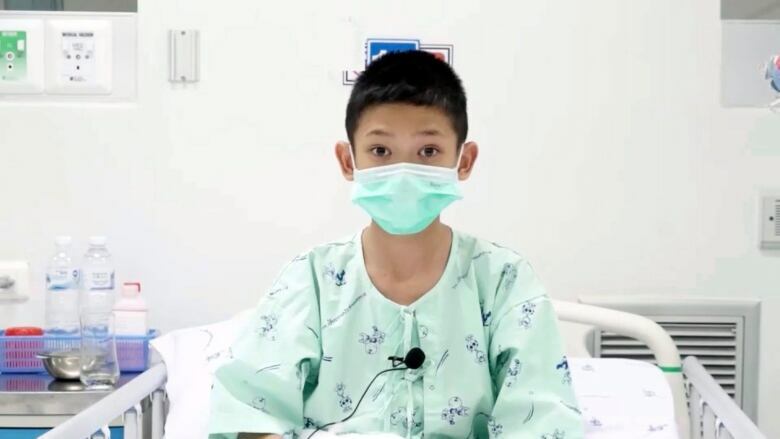 Another player, Adul Sam-on, 14, recalled the moment when two British divers found the group on July 2, squatting in a flooded chamber several kilometres within the cave complex. He added, "It was in the evening when we were scratching rocks on the top of the boulder and we heard voices." The group had planned to explore the Tham Luang cave complex for about an hour after soccer practice on June 23. But a rainy-season downpour flooded the tunnels, trapping them. "We took turns digging at the cave walls," said their coach, Ekkapol Chantawong, who has been credited with keeping the boys alive by some of their parents. "We didn't want to wait around until authorities found us." But their efforts were to no avail, he said: "Almost everyone can swim. Some aren't strong swimmers, however." The group, which had eaten before going into the caves, took no food on the excursion, and had to subsist on water dripping from stalactites in the cave during their ordeal, he said. The boys, who sported crisp haircuts, had gained an average of over six pounds each since the rescue, and run through confidence-building exercises ahead of Wednesday's event, the hospital director said. The boys, their coach and some rescuers were asked to answer a series of questions journalists submitted in advance, officials said. The rescue effort drew global media attention and hundreds of journalists, and excitement picked up again in the usually sleepy town of Chiang Rai ahead of the much-anticipated 45-minute live appearance broadcast on dozens of channels. 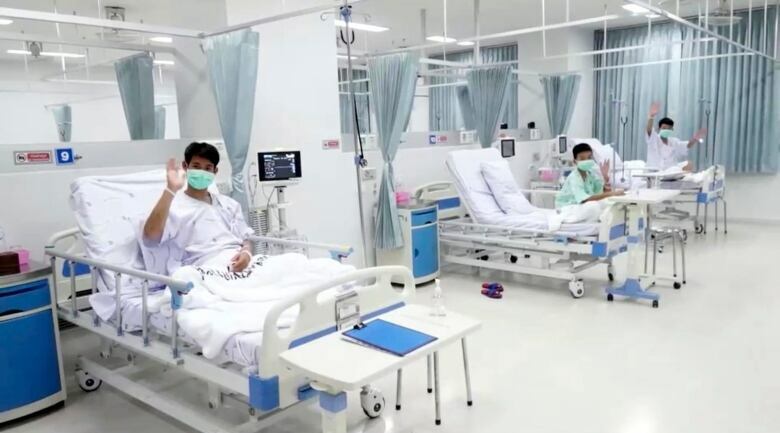 We don't know what wounds the kids are carrying in their hearts," said Justice Ministry official Tawatchai Thaikaew, who asked for the boys' privacy to be respected after the discharge, for fear that media attention could affect their mental health. "Everyone was very sad," said the coach. "They felt like they were the reason he had to die and his family had to suffer."